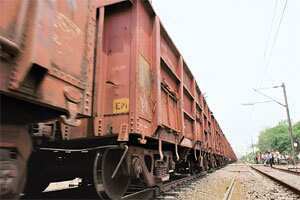 The railways will find it tough to secure a loan from the Japan Bank of International Cooperation for the dedicated freight corridor project unless it accepts a higher project cost, estimated by the Japan International Co-operation Agency (Jica), which has conducted a survey and filed a report to the Railway Board. In a 16 August front-page article, Mint had reported serious differences between Jica and the Railway Board on the cost estimate for the project. The board assessed the cost around Rs28,000 crore, while that of Jica’s was double that amount at Rs56,000 crore. Bumpy ride: A freight train in New Delhi. Tatsaya Masuzawa of Jica says it is possible to run triple-stack containers on an electrified rail. Electrification helps cut down on pollution and also to save on fuel cost. The dedicated freight corridor (DFC) project would set up a dedicated railway network between Mumbai and New Delhi, and Ludhiana in Punjab and Sonnagar in Bihar, to run freight trains. According to Tatsaya Masuzawa, a deputy team leader with Jica, the estimate worked out by the agency included many components not taken into account by the railways such as acquisition of locomotives and construction of container depots. “Unless you factor in the cost of all of these components, how will you have a proper railway corridor?" asked Masuzawa. After the railways differed with the higher project cost, Jica cut some corners and reduced the estimate to about Rs50,000 crore, he added. “It will not be possible to cut costs substantially any more." Meanwhile, Jica has estimated that the DFC rail project would displace around 3,000 households. The agency has said the railways should ensure the displaced people are paid market-rate price for their land and that they are given alternative employment or accommodation based on the requirements of each displaced family. Jica also plans to stick to its stand that the western arm of the freight corridor should be electrified, too. The railways had planned to run triple-stack container trains on this line and, hence, had decided to run only diesel locomotives here. “It is possible to run triple-stack containers on an electrified rail. We have seen such a project in China. Electrification helps cut down on pollution and also save on fuel cost," added Masuzawa. A railway official said the stand-off would be resolved only after a meeting between the two sides which would be chaired by the Prime Minister’s Office (PMO). “We have made our assessment clear. Now other entities such as the finance ministry and PMO will need to give us their inputs so that we don’t lose sight of the larger picture," the official said. The dedicated freight corridor was one of the significant projects which were discussed by then Japanese Prime Minister Shinzo Abe and Prime Minister Manmohan Singh when the former visited India last month. The freight corridor and an industrial corridor coming up alongside will also have participation from Japanese lending agencies.